Brian Tonna, the corrupt accountant who has all the information required to bring down the government and put the Prime Minister, his chief of staff and Konrad Mizzi in prison, has been given by that same Prime Minister the exclusive concession to sell Maltese citizenship and residence visas for the entire Middle East market. The worldwide Panama Papers story last April revealed that Tonna and his sidekick Karl Cini had, through Tonna’s consultancy firm Nexia BT, liaised with Mossack Fonseca in Panama to set up covert companies there, sheltered by secret trusts in New Zealand, for Konrad Mizzi, the Prime Minister’s chief of staff Keith Schembri, and a third man whose name was not contained in the email cache because it had been transmitted by Skype. As the only two people in Malta – the others are at Mossack Fonseca in Panama – who can confirm the identity of the third man and also reveal the full details of the once-secret companies and their purpose, Tonna and Cini are ideally placed to blackmail the Prime Minister, his chief of staff and Konrad Mizzi, and so have tremendous leverage over all three. Tonna also knows the full extent of Schembri’s other offshore dealings as he is the one who reorganised and restructured Schembri’s tangled network of companies and holdings in the British Virgin Islands, Gibraltar, Cyprus, Panama and New Zealand, all of which were concealed from the Maltese authorities. He also knows the full details of Schembri’s illicit involvement with other Maltese individuals, including Adrian Hillman, who was at the time managing director of Malta’s largest and most influential newspaper publisher. Last October, Tonna incorporated a company called Wahaat Services Ltd in Malta, registered at the offices of Nexia BT in San Gwann. The shareholders are BT International Ltd and Nexia BT Holdings Ltd, which own 50% each. Tonna, in his personal capacity, is the ultimate beneficial owner of both Nexia BT and BT International Ltd, making him the ultimate beneficial owner of Wahaat Services Ltd. Wahaat has opened an office in Dubai at Level 23, Boulevard Plaza Tower, 2 Sheikh Mohammed bin Rashid Boulevard. Through his links with Maltese operator Oliver Said, who networks in Dubai and Saudi Arabia and who has been a main focal point for the Labour government in its dealings there, Brian Tonna brought Ayman Sejiny, CEO of the Bank Al Khair, on board. Oliver Said works for Sejiny as a consultant. 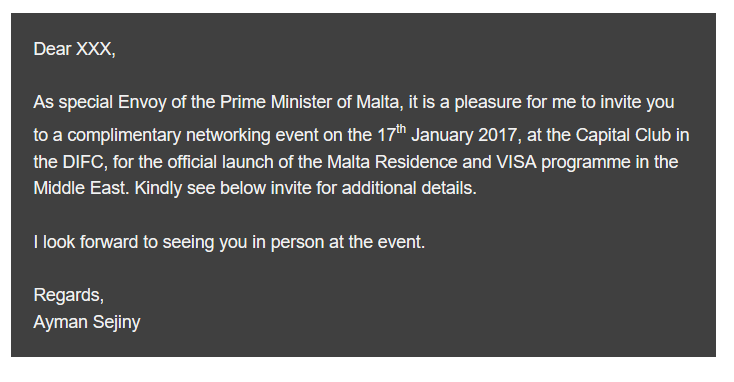 Using his leverage on Joseph Muscat, Tonna then had Sejiny named “Special Envoy of the Prime Minister of Malta”, which title he is now using actively to sell Maltese citizenship and residence visas (see images below). Brian Tonna does not appear anywhere on Wahaat’s website, but Karl Cini and Anita Aloisio, both partners at Nexia BT, are there. Wahaat’s ‘People’ section also includes Oliver Said, Tim Dambrauskas, Oliver Zammit and Philip Tissot. Tissot, who was deputy high commissioner at the British High Commission in Malta (1999-2002), took early retirement from the British Foreign Office in March 2013 to live in Malta. Peculiarly, he went from Deputy Permanent Representative to the UK Mission to the United Nations to working for a real estate agency in Malta. In September 2015, Brian Tonna recruited Tissot to work for Nexia BT, heading its Far and Middle Eastern Desk. Tissot gives his job description as “international trade and investment promotion, developing and expanding the company’s footprint in the Far East and Middle East regions”. “As Head of Nexia BT’s Far and Middle Eastern Desk,” he describes himself on LinkedIn, “my main role is to promote inward investment into Malta, company redomiciliation, as well as Malta’s citizenship and residency by investment programmes”. Last April, this website broke the story that Brian Tonna had set up a secret company in the British Virgin Islands, Willerby Inc, of which he is the ultimate beneficial owner, and that he uses it to invoice his legitimate Maltese companies for ‘referral fees’ on the sale of Maltese citizenship. This enables him to pay out a significant chunk of his Maltese companies’ earnings to his British Virgin Islands company, with the Maltese tax authorities being unaware that he is paying out the money to himself because his shareholding in Willerby is concealed by nominees. That story, which you can read here, was shared 11,500 times on Facebook via this website alone. Gain access to Europe through the Malta Residence and Visa Programme (MRVP) combined with opportunities to invest in property in Malta. 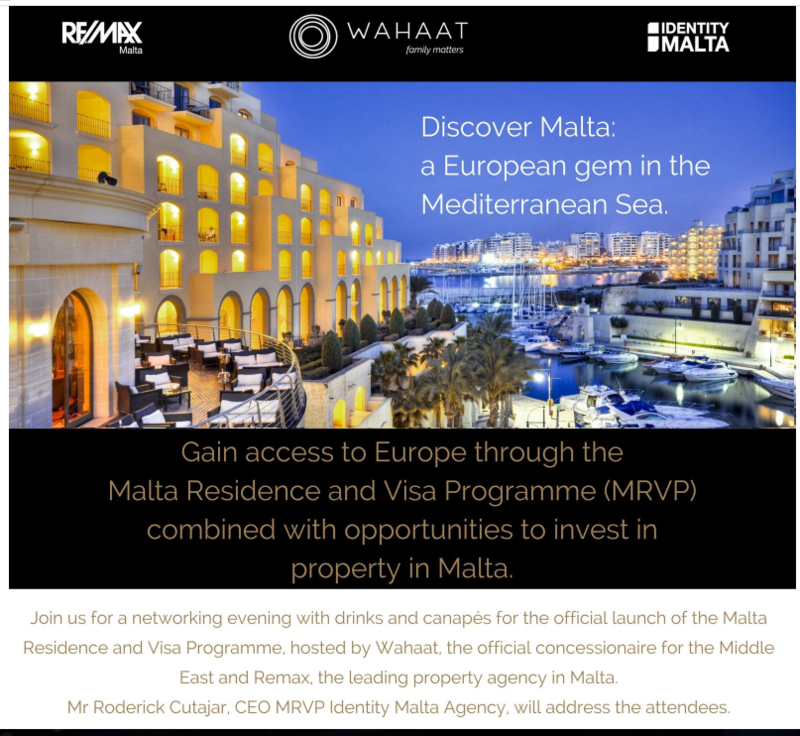 Join us for a networking evening with drinks and canapes for the official launch of the Malta Residence and Visa Programme, hosted by Wahaat, the official concessionare for the Middle East, and Remax, the leading property agency in Malta. 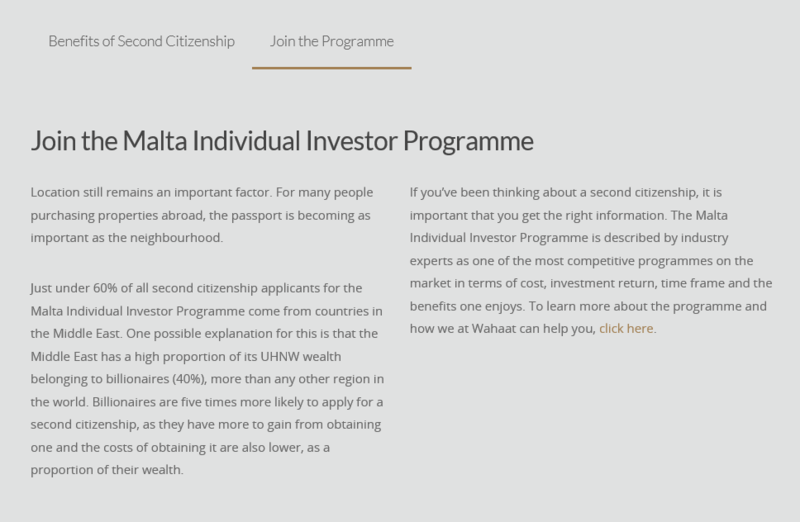 Wahaat’s website reveals two key pieces of information which the government of Malta has not: that “just under 60%” of all applications to buy Maltese citizenship come from “countries in the Middle East”, and that the government of Malta has so far sold citizenship to “700 people”. 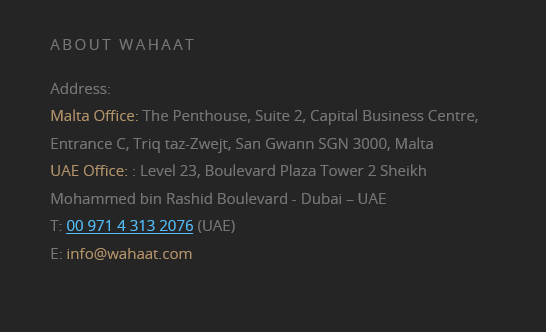 Wahaat’s website says that it “is affiliated with a top advisory firm based in Malta, Nexia BT, with offices based in Malta and Dubai” and that through its “strategic partner’s presence in over 120 countries, represented by 565 offices, Wahaat has vast experience in the development and provision of holistic services that are tailor-made for each individual client”. The reference appears to be to Nexia’s affiliated offices worldwide. 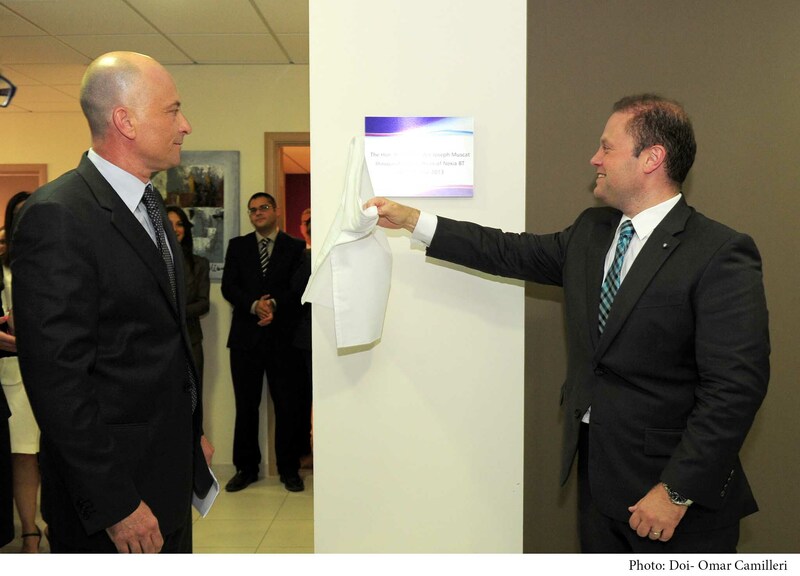 The Prime Minister declares Brian Tonna’s new offices officially open. Tonna is on left.